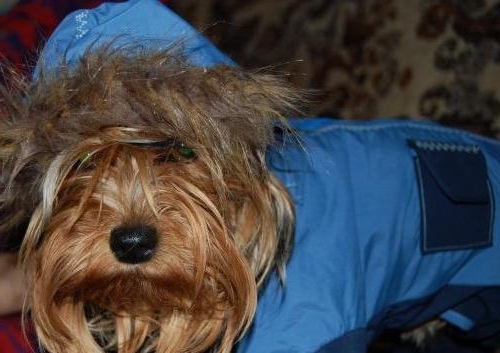 Dog lovers choosing clothes for your pet, pay attention to material quality, durability and reliability as it will be warm as well as fashionable design and style. Now you can buy clothes for dogs in a special store clothes for animals, but the number of shops and small sizes, often not suitable. So it's best if the owner himself will make your pet beautiful and original outfit. Before you begin the process of tailoring clothes for dogs, you need to determine the purpose, size, and style of clothing. Measurements of the animal with the owner is easy to remove, and choose the material is subject to the purpose things. If it's a winter jacket or pants - wool, corduroy, and if summer outfit, cotton, silk, maybe even chiffon. After selecting the style, you can begin sewing, it is necessary to use specialized literature for sewing with the finished pattern, which will significantly facilitate your work. May also be useful for sewing old clothes, for example, the use of unnecessary baby clothes or leftover scraps of fabric that you can reshape or slightly modify for your pet. With a little effort and imagination, you'll make the right for your dog comfortable and fashionable clothes. Smaller breeds of dogs made to wear. It is not only a fashion statement, but a harsh necessity. As a rule, such breeds as Yorkshire Terrier, Chinese crested, vestjylland white Terrier other hypoallergenic, and therefore does not have the undercoat. Summer clothes they need to protect it from overheating, and in winter from hypothermia. 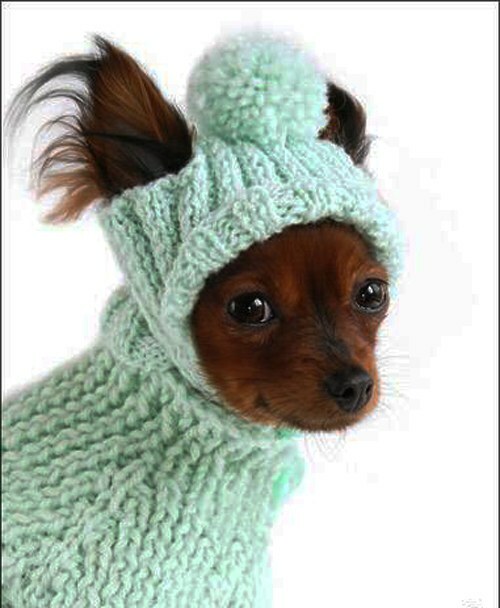 Small dogs need even a beanie to protect your head from the cold. However, caps, hoods and bonnets will not fit - so the dog is dulled hearing and it may be lost or not to hear the host team. Therefore, caps for dogs tally with slits for the ears. 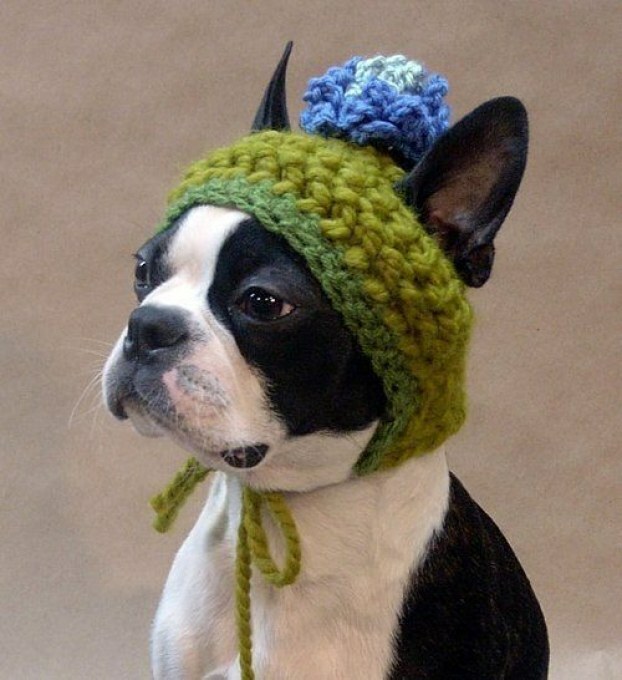 In order toknit a hat on your dog, remove the measurements. The first measurement is the circumference of your head. The second measurement is the distance between the ears. The third is the distance from the forehead (where to begin on the cap) to the line between the ears. The fourth measurement is the distance from the line between the ears to the base of the skull of the dog. Please note that unlike the hats of the human, here the third and fourth measurements are not the same, cap will be asymmetric. And the bigger the dog, the greater must be the difference between these standards. Pick up the yarn. It should be warm but not abrasive. For example, suitable children's acrylic. When buying wool, attach it to the neck or the crook of the elbow and hold for a few seconds. If irritation does not arise - feel free to buy. You can knit the hat in two parts - front and rear, but it is better to minimize the number of seams and to make a cap cap. Start to knit with back detail. Divide the circumference of the dog's head in two, and multiply by the number of loops that fit in one inch. Normal knit stitch - a number of purl loops, a number of facial. When you get to the base of the ears, decrease the knitting on the edges. For this promazyvaya together in two loops. Take loop to until number is not equal to the distance between the ears. Provarite the canvas, moving to the forehead. Gradually begin to add loops to do this on each side make the nakida before the last loop, and in the next row promazyvaya them. Tie the product to the forehead of the dog filmed for you standards. Once you going to finish my close knitting and stitch the sides of the cap to the base of the ears. In these places you can also sew ribbon to tie them under the dog's snout, so the cap will stay tight.